Meanjin was founded in Brisbane by Clem Christesen (the name, pronounced Mee-an-jin, is derived from an Aboriginal word for the finger of land on which central Brisbane sits) in 1940. It moved to Melbourne in 1945 at the invitation of the University of Melbourne. It currently receives funding from the university, the Literature Fund of the Australia Council for the Arts, CAL and Arts Victoria as well as receiving vital support through subscriptions and other sales. 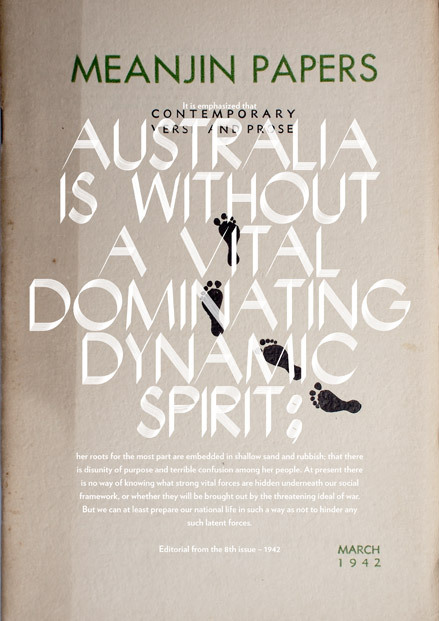 Known primarily as a literary magazine, Christesen ensured that Meanjin reflected the breadth of contemporary thinking, be it on literature, other art forms, or the broader issues of the times. This breadth has characterised Meanjin for more than 65 years, continuing under its seven subsequent editors - Jim Davidson, Judith Brett, Jenny Lee, Christina Thompson, Stephanie Holt, Ian Britain and Sophie Cunningham. 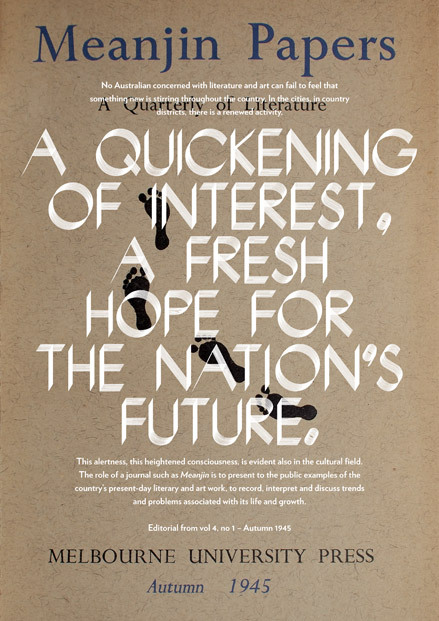 Meanjin has published some of the earliest serious discussion of subjects that have since attracted sustained attention, including migration, television, suburbia, popular music, the Anzac tradition, Australia's 'cultural cringe', museums, drugs, food and travel. While the main focus is on Australia, Meanjin also gives wide coverage to issues of global concern. It is committed to publishing the best of new writing in Australia.